I, like millions of children in America and across the world, grew up watching Mister Rogers' Neighborhood, which aired on PBS from 1968 through 2001. 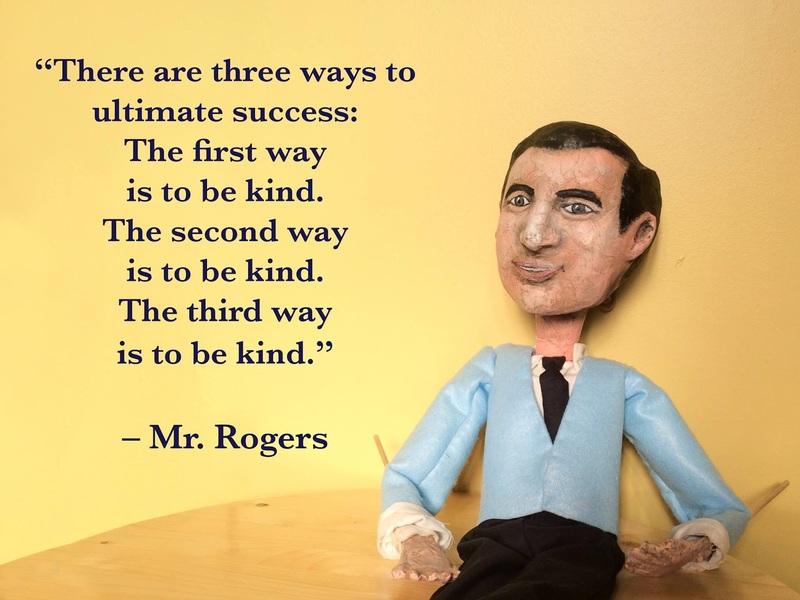 But I don't think I realized at the time what an exceptionally good and kind human Fred Rogers was, a strong advocate for children's education and development, and for kindness towards all. All I knew as a kid is that Mister Rogers' Neighborhood was a comforting place to spend a half hour, and I especially loved the Neighborhood of Make Believe (where I first experienced opera). In the Heart of the Beast Puppet and Mask Theatre, located in the Phillips neighborhood of south Minneapolis, is premiering an original multi-media play called Make Believe Neighborhood that pays homage to the work of Fred Rogers, as well as to the good work being done in their own neighborhood. I spent much of the two hours with tears behind my eyes, so moved by the kindness of my childhood favorite, and by the inspirational people working to create and strengthen community in Phillips. In a world of increasing violence, negativity, and divisiveness, spending a little time in this Make Believe Neighborhood, and learning how one neighborhood is making Mister Rogers' vision a reality, is a balm to the soul. The story of Make Believe Neighborhood is told in seven chapters, each chapter beginning with some narration about Fred Rogers' life and work, and ending with a story from the local community that embodies his mission of kindness and neighborliness. We learn about Mister Rogers' inspiration, his family, his career, his famous testimony before a Senate Committee, and his friendships. Scenes are acted out as charming puppet plays, or with one of the four performers (Angela Olson, Laurie Witzkowski, Masanari Kawahara, and Seth Eberle) wearing a Mister Rogers mask and his signature cardigan. It's all very inventive and delightful, in the signature HOBT way. 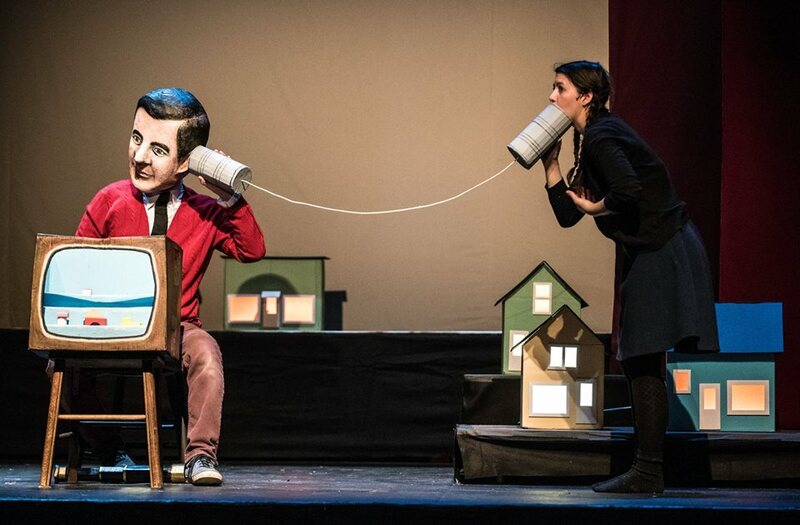 The neighborhood stories, gathered through interviews with dozens of people, are told through audio, video projected onto curtains or set pieces, puppetry, shadow puppets, drawings, and even lamps! What could be just a dry display of recorded material is anything but that, due to the diverse and inventive ways the stories are told. Stories of volunteering, connection, relationships, and support that truly give me hope for the future of this country, at a time when that's difficult to find. Another thing I didn't realize about Mister Rogers is that he was an accomplished musician, and wrote most of the songs featured on his show. Of course everyone knows the iconic theme song "Won't You Be My Neighbor," but the play also includes several other songs from his show that I'm certain I haven't heard in 30 years or more, but touched a deep memory in my brain and/or heart. Songs like "It's You I Like" and "Many Ways to Say I Love You." The music is recorded and played throughout the show as a sort of Mister Rogers techno re-mix by music director/DJ Martin Dosh (along with some live accompaniment). That sort of techno sound usually isn't my thing, but I found it to be very cool and even lovely, adding so much to the storytelling. There are so many moving pieces in this play, from the physical set pieces, puppets, shadow puppets, scrolls of drawings, to the sound and video elements, and it all plays out flawlessly under the direction of Bart Buch, who also wrote the play. All of these different elements come together to create something so magical, and so sweet, but so very grounded in the place where the theater resides (set design by Duane Tougas and Bart Buch, sound design by Kevin Springer, video design by Nolan Morice and Madison Ballis). Using music, puppetry, quotes, audio recordings, video projections, In the Heart of the Beast has made a piece of theater that truly embodies the life and work of one of the best humans Fred Rogers, as well as the wonderful humans in the Phillips neighborhood. Truly, go see it, with or without kids. I suppose kids would enjoy it too, but I think it's us grown-ups who really need a little more Mister Rogers in our lives right about now. Make Believe Neighborhood continues through February 25 only. For more information and to purchase tickets, click here.